As and when your office receives new requests from customers, typically they get actioned right away by creating jobs in Loc8 and the jobs are suitably assigned to you and other technicians. On receiving new jobs, you're on your way to ensuring those jobs are completed on time. 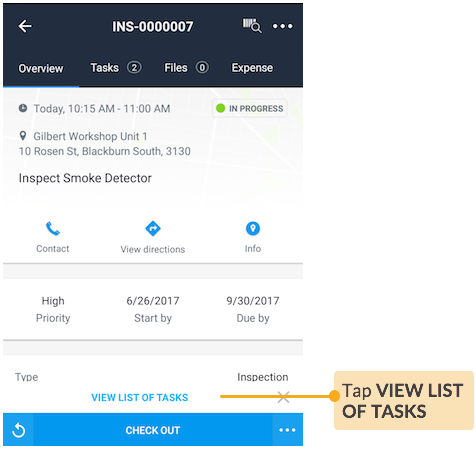 With the mobile app assisting you all the way, it's easy to track, record and end your work. 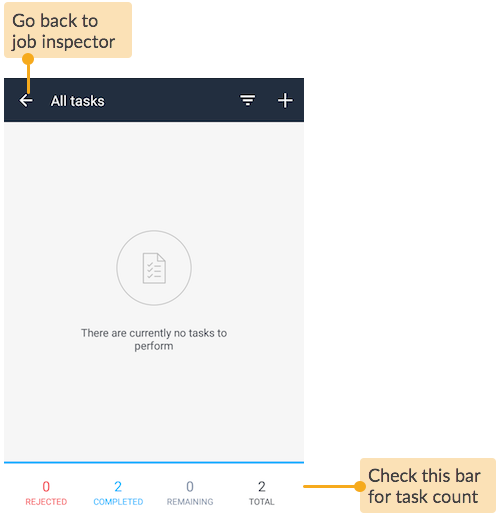 You can view and filter your jobs as explained in View Jobs in a Timeline and View Jobs in a List, get notified about any change of events, which basically depends on the notification preferences your company has configured as explained in Configure Standard Notifications, and easily progress through the stages of a job lifecycle, as explained in Introduction to Jobs. Besides, you have the flexibility to check out anytime from the site and later pick it up from where you had left, and also complete your jobs either alone or when working with your fellow technicians. Open a new job or an already accepted job that you wish to work on. 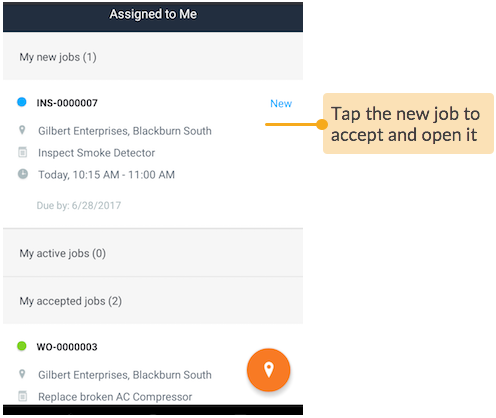 NOTE: If your company is subscribed with Lite edition, tapping a new job will automatically add the job to My accepted jobs. Drive to site by following the directions shown on the map, and record your travel hours. 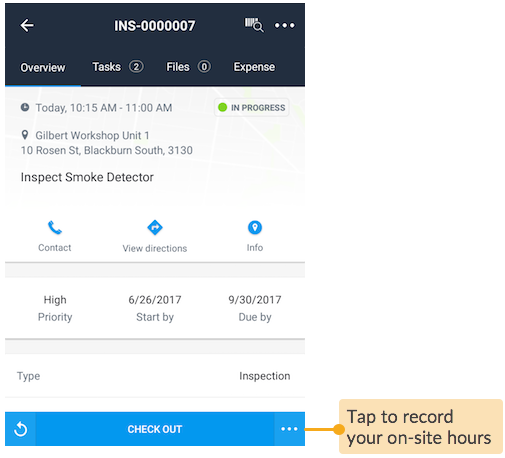 When you reach the site, check in to record your on-site hours. Go through the list of tasks in your job. The tasks would have been added by your office staff or your manager. 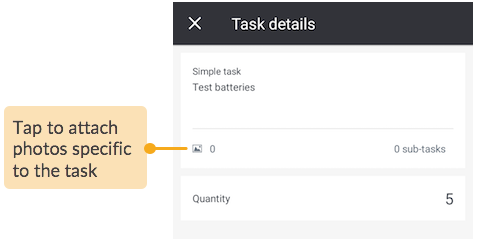 You can also add new tasks to your jobs whenever required. 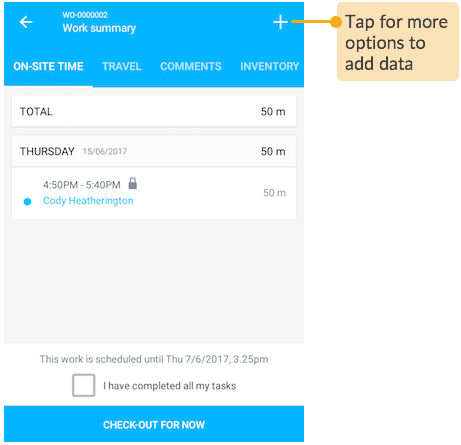 Read about it in article Add Field Data to your Job. 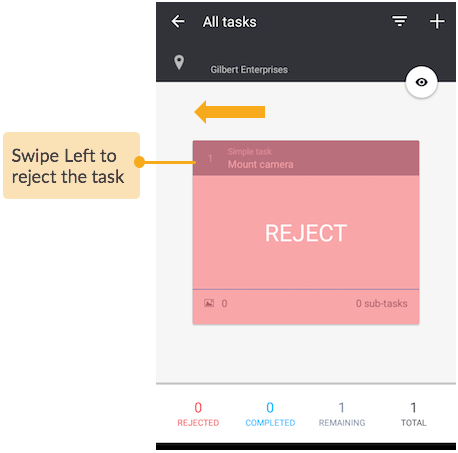 Now, you may either have to attach relevant photos to the tasks and then mark it as completed, or you may want to straightaway complete or reject the task, both of which have been discussed below. 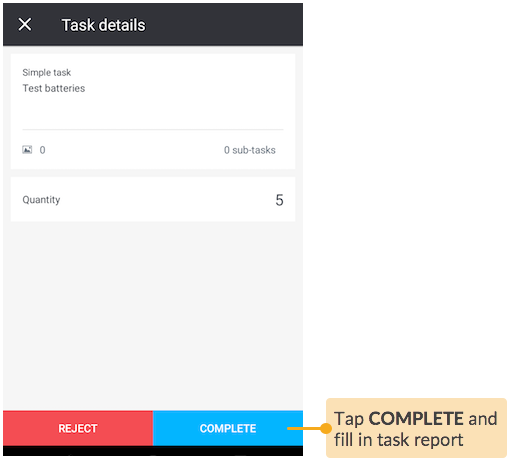 An updated count of all the tasks is indicated at the bottom of your screen. You can reset a rejected task so as to start working on it this time through to completion. 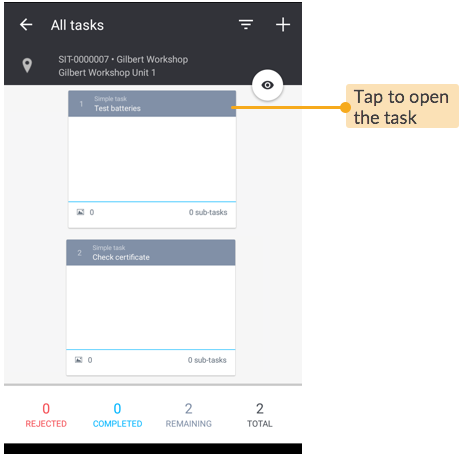 Open the rejected task and then tap RESET TASK at the bottom of your mobile screen. At this point, you may choose to complete all of your tasks at one site visit and end your work or, you may complete only a few tasks for now and return to completing the rest later, anytime before Due by date. In any case, the next thing you would do is check out of site. 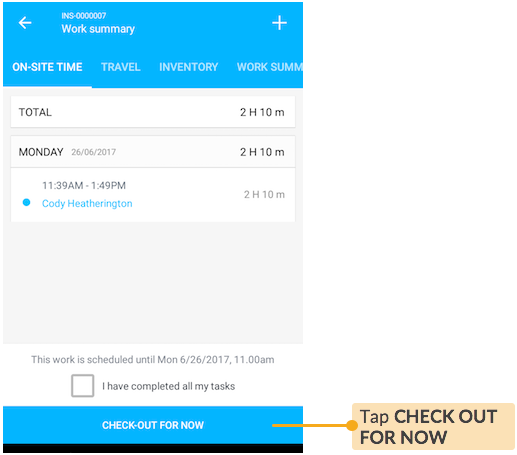 On leaving the site, check out to automatically record your on-site hours. The travel hours are automatically recorded from the time you Drive to site till you Check in. 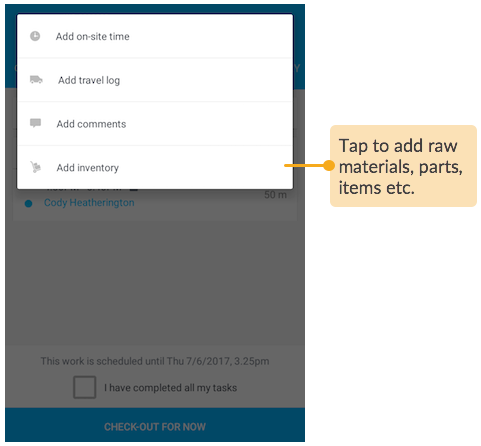 If required, you can manually edit the start and end of the travel time in the Work summary. 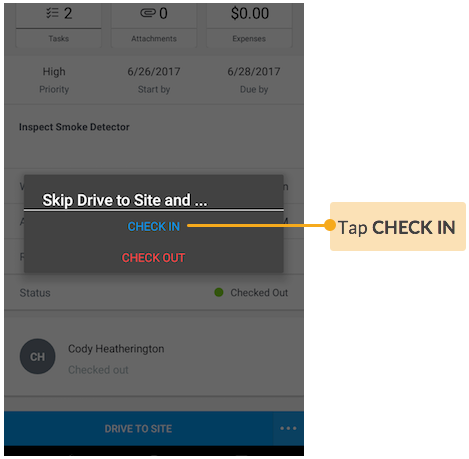 The on-site time is automatically recorded from the time you Check in to the site till the time you Check out. That onsite time cannot be updated. 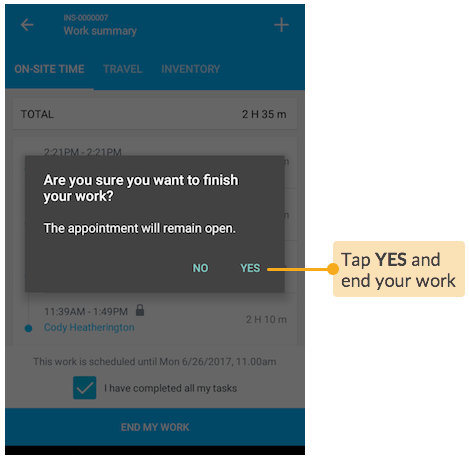 If you want to record additional on-site hours, you would manually add and edit the start and end time in the Work summary. 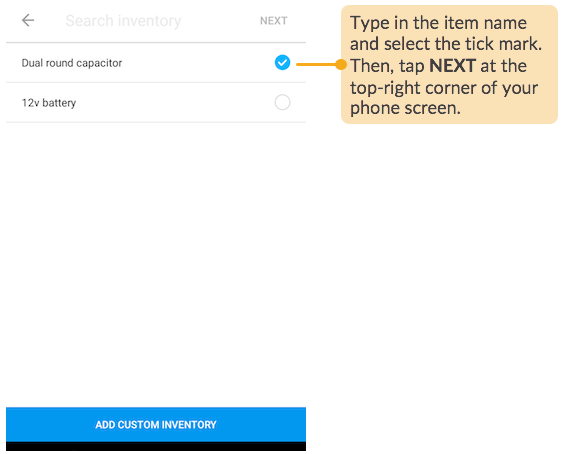 Specify all parts and materials used from your company's inventory to perform the job. You can add one or more inventory items. 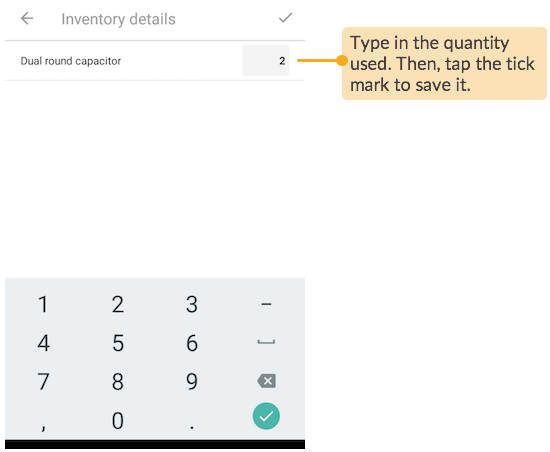 Select the inventory items to specify their quantity used. 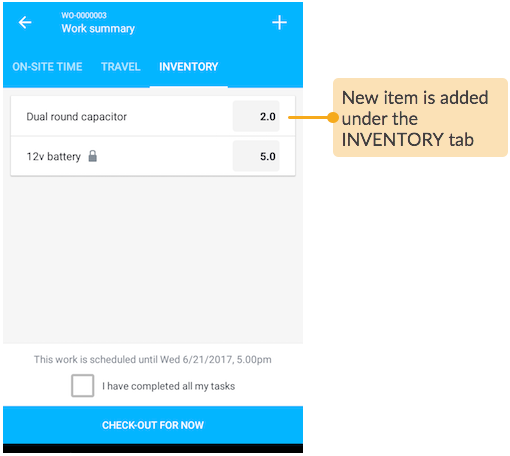 You'll find that the new items are now listed under the INVENTORY tab in your Work Summary. 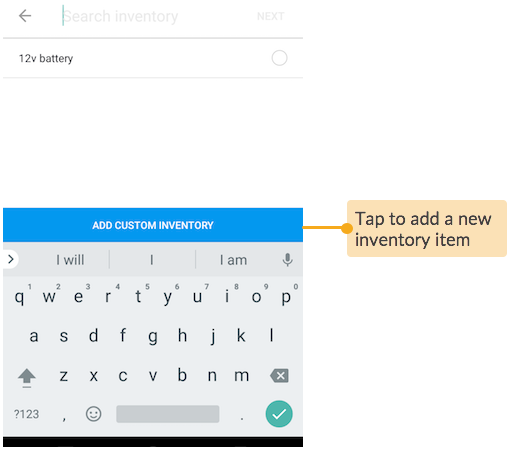 NOTE: After you have checked out from the job, you will not be able to change the added inventory items any more. To delete or update them, please contact your manager or any of your office staff. You can temporarily check out from the site for now, and check in later again to complete the remaining tasks within the same appointment. 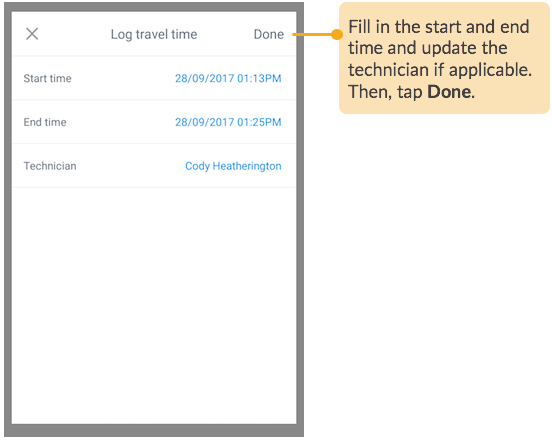 When you return to complete the remaining tasks, you can directly Check in to avoid logging any travel hours again for the same job. Once you have checked back in and completed all the tasks, you are ready to end your work as discussed below. 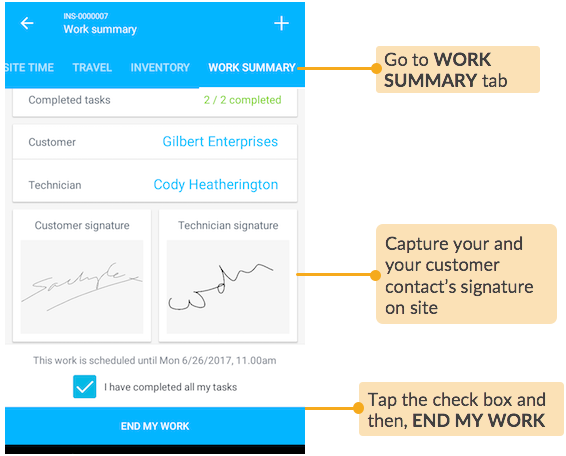 Review the work summary, and capture your and the customer contact's signature. If you're working along with other technicians on the job, that particular appointment will remain open until the last technician has checked out. See the two scenarios below and action accordingly. On checking out, inform Loc8 that you are not the last technician on site. 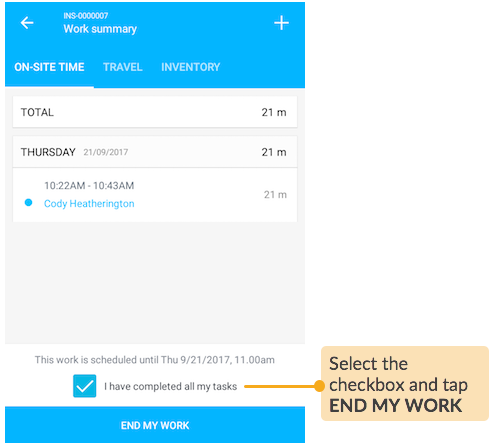 On the Work summary, mark your tasks as Completed by tapping I have completed all my tasks and end your work. Check the first screen of the job, it will indicate the real-time status of other technicians. 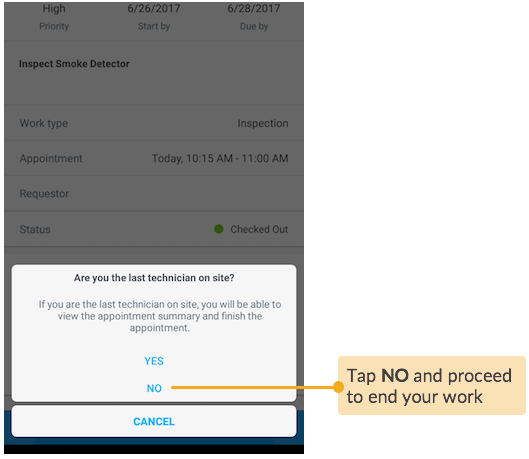 Ensure that all other technicians assigned to the job have finished their work on site, so you can check out as the last technician. 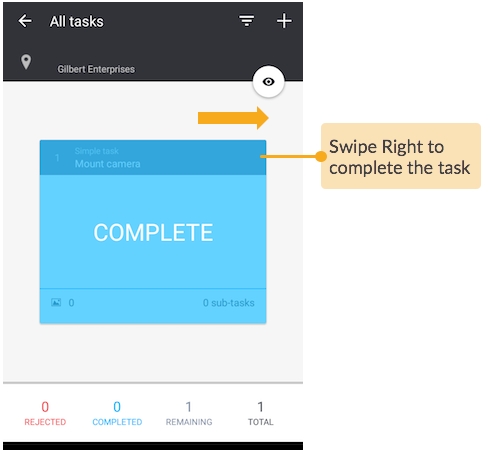 Next, review the work summary, capture signatures, and end your work. The appointment will then be closed and the job will be marked as completed. That's all you need to finish your tasks and end your work. 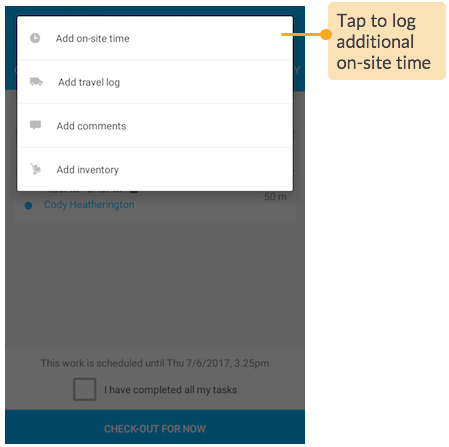 Yourwork log is continuously being sent to Loc8 on web browser which your team in office can view and update. 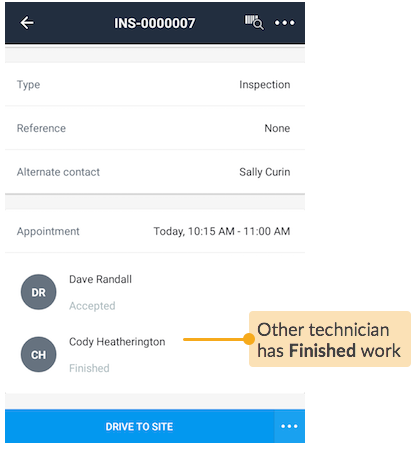 As soon as your job is completed, a notification will be sent via email as well as within the mobile app in the Notifications tab informing that the job is done.